You got to love simple socks-- Cast on, make a cuff, and then miles of simple stocking knit--a bit of shaping for the heel, a few decreases and more stocking knit. Self striping yarn is perfect for simple socks. The stripes and patterning make things interesting all by themselves. I find I alternate between fancy stitch work, and simple socks. The current socks are almost simple. Just a little bit of falderal. 1—The Cast On and Cuff. The cast on is a tubular cast on—one of my frequent choices for socks—especially because I tend to like 1 X 1 ribbing. A tubular cast on can be used for 2 X 2 ribbing.. but it’s a PITA—and there are other cast ons, that are just as stretchy, and just as attractive, and better suited to 2 X 2 ribbing. After the cast on, I worked 3 rows of simple double knitting (K1, S1) and then joined into a round. At that point—I switched to white. A half dozen or so rounds latter--8 to be precise!--a black stripe, and then finally the self striping yarn. I did 3 rounds of ribbing with the self striping—I tend to like my sock cuffs to be 1.5 inches—I dunno why—I just do. Still just a bit of simple stripes elevate the cuff from plain to a bit fancy. 2—In theory, if these are simple socks, there is nothing more to say. I should just be working on 6 or so inches of leg in plain stocking knit—and letting all the design be what ever the jacquard yarn turns out to be. BUT—(you knew there was a but, right?) sometimes, a simple sock looks nicer with a small detail. They will continue down past the heel and into the instep –by placing them on the front of the sock, the heel (likely to be an after thought heel) won’t interfere with the smooth line of the cable. For some reason—these little cables are being difficult—and I’ve not be successful working them with out a cable needle. Maybe it was a mistake to include them. But they are there for now! Right now, the socks don’t look too turquoise—but that’s just were I started in the color/stripe pattern. You can see in the ball—turquoise is a dominant color! Some things just never lose their charm:) I have bought a book for knitting two socks on one circular needle, but have not taken the time to learn. You've inspired me to try again! PS I think the cables look just fine! I usually like to create my own stripes (I feel more in control when I can choose colors and widths), but self-striping yarn is always a great way to get away from a billion little ends. Not to mention that watching the colors change by themselves is a treat! 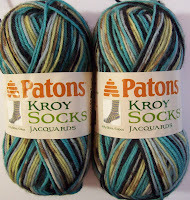 Is that a brand new Kroy colorway that I haven't seen yet? or is it an old one that I missed before I learned to knit? I love it!! Okay, I found the color. They are pretty.